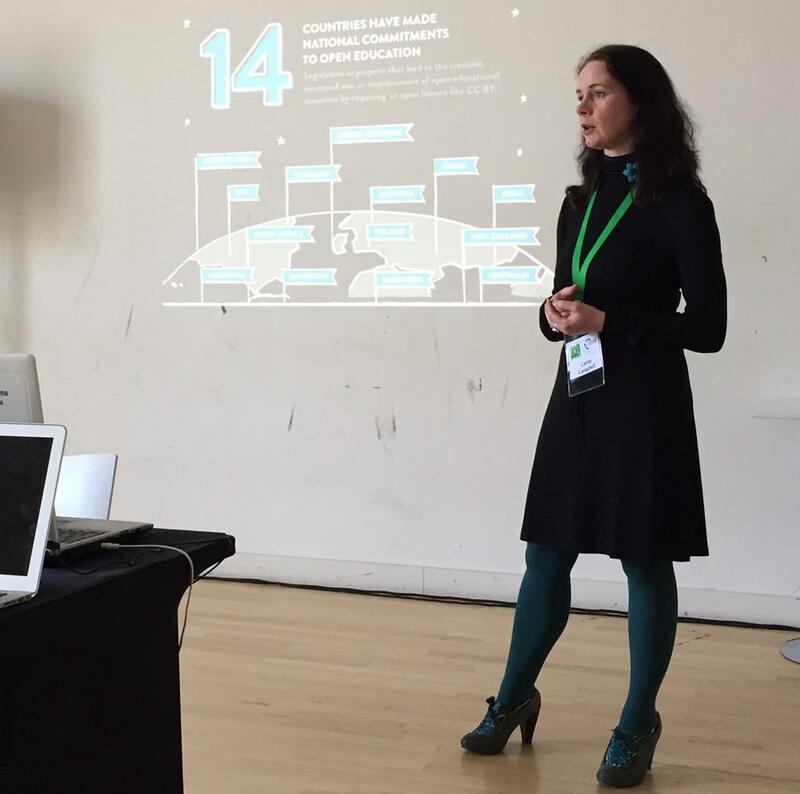 Last week I presented one of the keynotes at the FLOSS UK Spring Conference in Edinburgh. I had been invited to present as the organising committee were keen to diversify both the scope and the gender balance of their event, after a first call for papers brought in only male speakers. Persuaded by the enthusiasm and commitment of the organisers, and after discussing the invitation with colleagues at the University, I accepted their invitation. However after a second round of blind peer review again brought in only male speakers (thus illustrating the problem of blind submission in any domain that already lacks diversity) I began to get a bit apprehensive. Normally I would politely decline an invitation to participate in an all-male panel and now here I was keynoting at an all-male conference. I discussed my concerns with the organisers who once again were sensitive to the issue, keen to talk and open to suggestions. And I was more than a little relieved when my inspirational senior colleague Melissa Highton, Director of Learning, Teaching and Web Services at University of Edinburgh was invited to open the conference, and Christel Dahlskjaer, VP of Open Source and Digital Advocacy at Private Internet Access, was also added to the programme. My talk was scheduled to take place on the second day, but I went along on the first day to hear Melissa’s opening address and Debian Project Leader Chris Lamb’s keynote. I had expected female delegates to be in the minority, but I was a little startled to discover there were only three women in the room out of an audience in the region of around eighty people. Melissa raised this issue diplomatically in her opening address which included a call for more diversity and inclusion in technology industries. I need all the #femedtech people and #uncommonwomen to send good thoughts my way tomorrow morning. I'm giving a keynote at an all male tech conference. To say that I was overwhelmed by the response would be an understatement, so I’d like to thank each and every one of you who replied to my tweet, I can’t tell you how much I appreciated your support. I also tweeted a thread of all the inspiring projects and initiatives that I had included in my talk, because if you’re speaking about diversity and representation I think it’s really important to give credit where credit is due. The twitter thread proved to be really popular so I might do this again next time I’m giving a talk. On the morning of my keynote I was encouraged to see a couple more women in the audience, maybe five in total? But it was still pretty daunting to get up onto that stage. The audience however were faultlessly polite and engaged, particularly when I spoke about structural inequality and lack of representation in technology domains and open communities. I ended by highlighting the story of Bassel Khartabil and the Memorial Fund that Creative Commons established to commemorate his legacy, because I believe it demonstrates why it’s so important for all those of us who work in the broad domain of Open Knowledge to come together to break down the barriers that divide us. I always find it difficult to talk about Bassel and this time was no exception. I choked when I tried to read a passage he wrote from Adra Prison in Damascus and I was almost in tears by the end. However I make no apology for getting emotional over such an important story. There was only time for a couple of questions after my talk, one about business models for openness and another about how the conference could become more diverse and inclusive without compromising the integrity of their peer review process. During the break afterwards, I was really touched by a young delegate from the University of York who said he had benefitted so much from working in open source software projects and using Wikipedia, and wanted to know how he could give something back to the community. I suggested becoming a Wikipedia editor and gave him some pointers on how to get started. And I also really enjoyed chatting with some Edinburgh Informatics students who were hugely enthusiastic about the University’s commitment to Open Knowledge. Although there wasn’t a great deal of activity around the conference hashtag, I was touched to get one or two really supportive comments from delegates. Fantastic keynote by @LornaMCampbell @flossuk on open knowledge, systemic bias and barriers and the cost of freedom. Inspiring and moving. So much to do. All in all the conference was a pretty daunting event for me, but it’s one that I learned a lot from, not least how supportive my own Open Knowledge community is and how willing other communities can be to listen to new stories and alternative points of view. So I’d like the take this opportunity to thank the organisers once again for inviting me to keynote. Last word has to go to the fabulous Kelsey Merkley. Vulnerability is a strength and a indicator of true leadership. Is there a video somewhere? Way to take up space and kick the door in. I loved the tweet stream of projects highlighted. A nudge is as good as a kick. 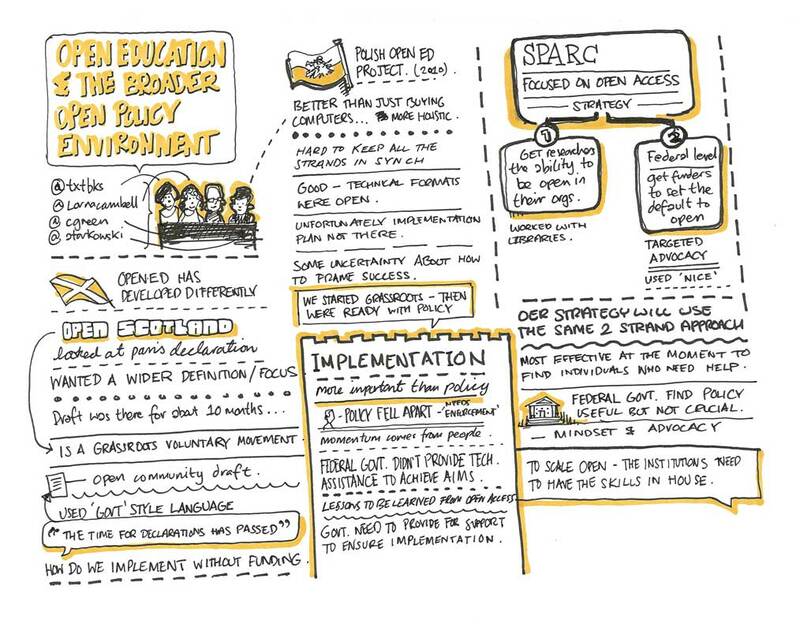 Transcript and slides from my keynote at the FLOSS UK Spring Conference in Edinburgh. I’m not a programmer. I’m not a developer. And I don’t contribute directly to the creation of free and open source software. I originally started out as an Archaeologist but I now work in the domain of Open Knowledge and more specifically open education. I currently work for the Open Education Resources Service within the Information Services Group at the University of Edinburgh, I’m a Board member of both the Association for Learning Technology and Wikimedia UK, and a member of Open Knowledge International’s Open Education Working Group. All these organisations are part of the Open Knowledge landscape and what I want to do today is provide a broad overview of some of the different domains, communities and cultures that make up this landscape including open education, open data, open textbooks and Open Access Scholarly works. And I also want to explore the boundaries that crisscross this landscape and demarcate these open spaces, and ask who is included, who is excluded, and what we can do to make our communities more diverse and inclusive. In the words of the late, great Maryam Mirzakhani, former professor of mathematics at Stanford University and the first female winner of the Fields Medal, who sadly passed away last year. So that’s what I want to do today, to look at how we can cross the imaginary boundaries of the Open Knowledge landscape and connect our different open communities. This is a transcript of a talk I gave as part of the Open Med Project webinar series. Open education is many things to many people and there’s no one hard and fast definition. A way to save money? 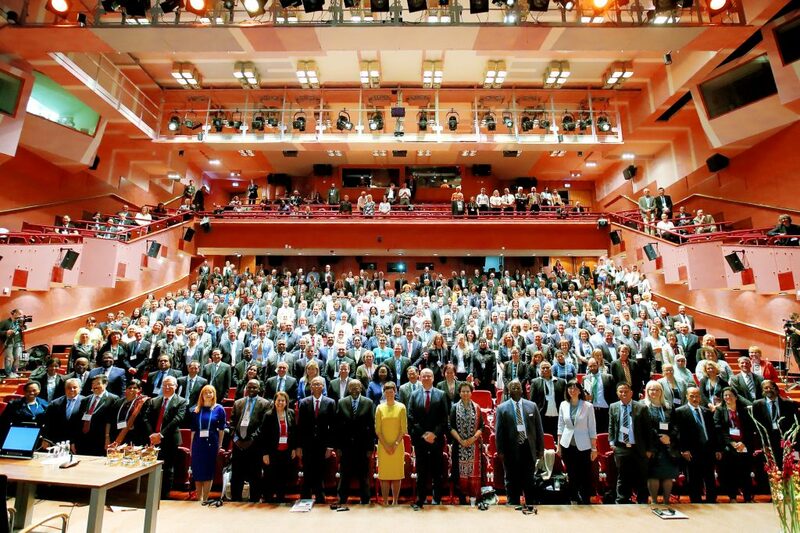 Last month I had the opportunity to travel to Slovenia to represent the University of Edinburgh and Open Scotland at the UNESCO OER World Congress in Ljubljana. The theme of the Congress was “OER for Inclusive and Equitable Quality Education: From Commitment to Action” and there was a strong focus on how OER can help to support United Nations Sustainable Development Goal 4. The main output of the Congress was the UNESCO Ljubljana OER Action Plan and accompanying Ministerial Statement. The Action Plan outlines 41 recommended actions in 5 key areas to mainstream OER and to help Member States to build knowledge societies and provide quality and lifelong education, and I’ll be writing a short blog psot on the Action Plan later. It would be impossible to summarise such a diverse event in a single blog post so I just want to pick out some of my own personal impressions. 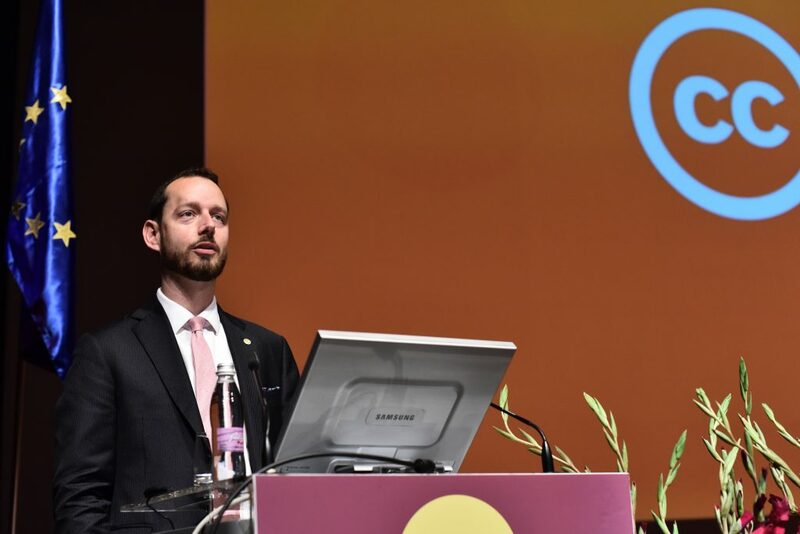 The first thing that struck me was that the event really lived up to its ambitions to be truly global with over 500 delegates from 111 countries present. I attended lots of “international” and “global” events when I worked in learning technology standards development but they were always heavily dominated by delegates from the US and the global north. I think the OER World Congress is the first event I’ve been to that actually felt genuinely global. That made it all the more disappointing that there were so few delegates present from the UK. The only other UK participants were Joe Wilson (Open Scotland) and Leo Havemann (Open Knowledge), and there was no official representation from either the UK or Scottish Governments. Given that the UK was once at the forefront of innovative OER initiatives with the #UKOER Programme, that’s a pretty depressing state of affairs. I heard a lot of inspiring and thought provoking talks over the course of the three days, but one that gave me pause for thought, though perhaps not for the right reasons, was Sir John Daniel summing up of a panel discussion on actions and impacts. John suggested that we have a long way to go before OER reaches the tipping point of general use and that there is a “lamentable lack of data on OER use”. There’s certainly some truth in this, but I don’t think there has been as little progress as he seemed to be suggesting. John also argued that MOOCs have benefits over OER because they are complete courses, before going on to mention how much he enjoyed FutureLearn courses. This seems to me to be highly debatable given that many (though admittedly not all) MOOCs are neither open nor reusable in any real sense of the word, particularly now that many platforms are time limiting access to course resources. I was inspired however by CEO of Creative Commons Ryan Merkley’s keynote. Ryan presented us with a clear and unambiguous message as to why OER is so important. 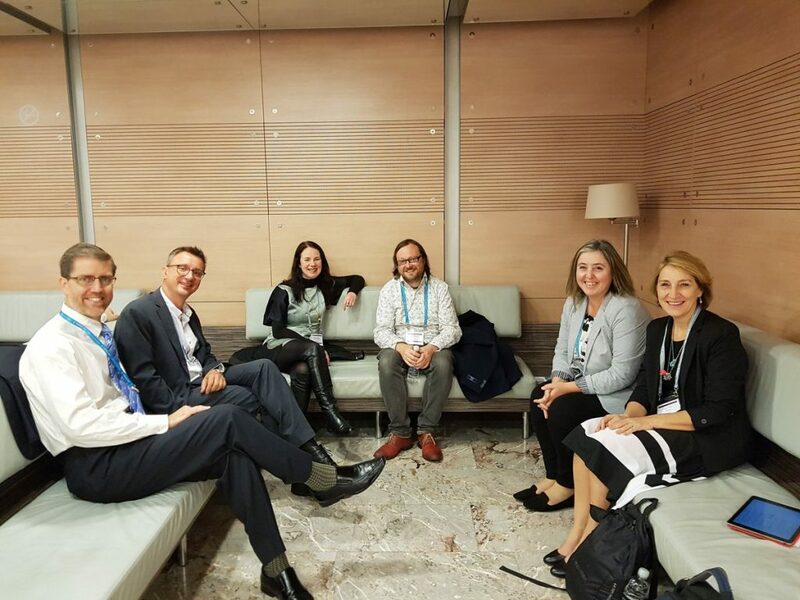 The Congress also provided a rare opportunity for members of the Open Education Working Group Advisory Board to meet face to face and I’ve written another blog post about that meeting over at the Open Ed blog. 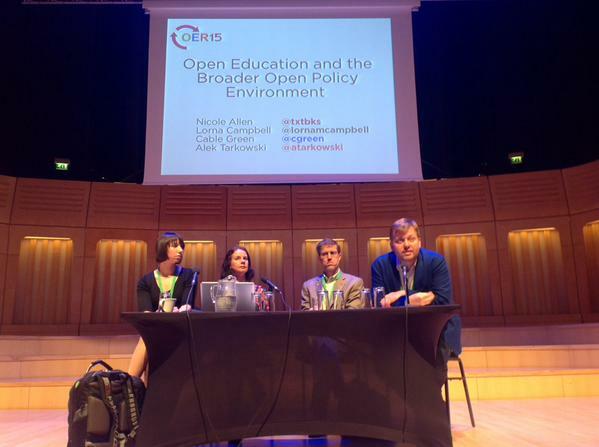 (L-R) Cable Green, Fabio Nascimbeni, Lorna M. Campbell, Leo Havemann, Virginia Rodés and Sophie Touzé at the OER World Congress, Ljubljana. And it was also great to meet members of the Open Med project and to pick up a copy of the Declaration du Maroc sur les Ressources Educatives Libres; the OER Morocco Declaration which is based on the Scottish Open Education Declaration. And you can see a short interview with me talking about the Declaration and open education initiatives in Scotland and at the University of Edinburgh in this interview with Jöran Muuß-Merholz. 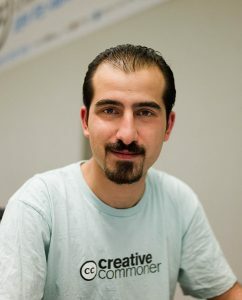 This is my personal reflection on the devastating news that Syrian open knowledge advocate Bassel Khartabil was executed by the Syrian government in 2015. Some of you will already know that before I worked in open education I used to be an archaeologist. My main interest was the North Atlantic Iron Age and I spent a lot of time working on excavations in the Outer Hebrides where I was born and brought up. However I also spent one memorable summer working in the South Hauran Desert in Jordan near the Syrian Border. It was a bit of a life changing experience for me, I fell quietly in love with the Middle East and when I got back to Scotland I realised that I was stuck in a rut with my job so I decided to leave archaeology while I still loved the subject and turn my hand to something else instead. By rather circuitous routes that something else turned out to be open education, and it’s something which I have had a deep personal and ethical commitment to for over ten years now. 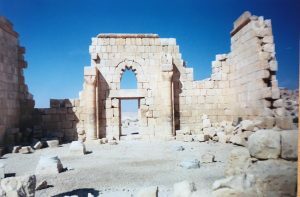 I never lost my love of archaeology though and I always regretted that while I was in Jordan we didn’t cross the border into Syria to visit Palmyra and Damascus. We had one week free at the end of our fieldwork project and it was a toss up between Petra or Syria. Petra won. Years later I watched in horror as Syria descended into civil war and Palmyra became a battleground. Tragic as the destruction of Palmyra has been, it pales into significance beside the huge number of lives that have been destroyed in the conflict. About a year later Adam Hyde of Booksprints.net, who ran a booksprint for us at the end of the the UKOER programme, contacted me and asked if I would be willing to write a piece for a book to raise awareness of the disappearance of Syrian open knowledge advocate, Creative Commons representative and active Wikimedian, Bassel Khartabil. I was horrified to learn of Bassel’s disappearance and immediately agreed. 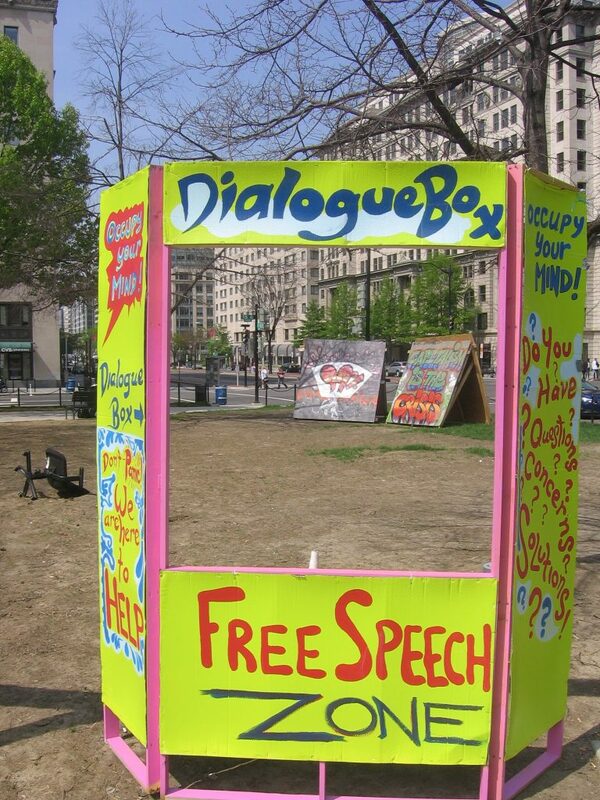 My contribution to the open eBook The Cost of Freedom: A Collective Inquiry is called The Open World. Since then I have talked and blogged about Bassel at every opportunity, most recently at the OER17 Conference The Politics of Open and re:publica, in order to help raise awareness of his plight. I never met Bassel, but his story touched me deeply. Here was a man who lost his liberty, and we now know lost his life, for doing the very same job that I am doing now. This is why openness, open knowledge, open education, open advocacy matter. I was on holiday in Brittany when I heard about Bassel’s death via Catherine Cronin on twitter and I was deeply, deeply saddened by the news. I still am, and I’m still struggling to express this in words. At the moment, I’m not sure I can put it better than the words I used at the end of my OER17 lightning talk Shouting from the Heart. The plight of Bassel Khartabil is a sobering reminder of the risks of openness, proof that open is always political, but it’s also shows why we need openness more than ever, because openness is inextricably bound up with freedom. And in the words of another older declaration, the Declaration of Arbroath. First of all a confession – I can get quite emotional about copyright and licensing :’} So emotional in fact that Jane Secker’s ALT Conference keynote Copyright and e-learning: understanding our privileges and freedoms actually brought a wee tear to my eye. You might think I’m making this up but it’s true, and the reason why is that copyright and licensing is ultimately about rights and freedoms and, at this point in time more than ever, what could be more important and fundamental than that? One of the things that fascinates me about copyright is that people often hold contradictory views on it at the same time. On the one hand there is a nebulous fear of copyright founded on the assumption that both copyright and licenses are preventative and punitive and that getting it wrong will call down the wrath of lawyers. On the other hand there’s a general assumption that anything that’s out there on the internet can be reused without permission, because if you weren’t happy with your stuff being reused you wouldn’t put it online in the first place, right? Encouraging colleagues to engage with copyright is no easy task, it’s seen as dry and dull and vaguely threatening. However engaging colleagues with open education resources (OER) is a great way to raise awareness of both copyright an licensing. 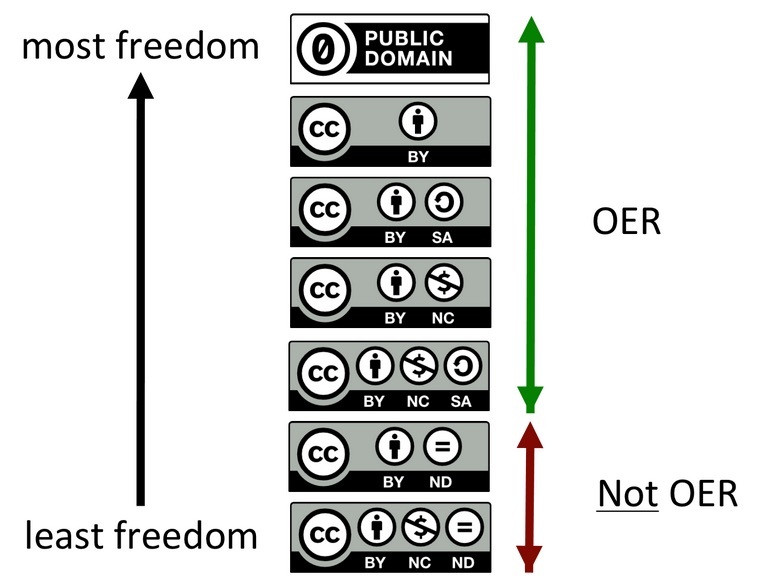 Learning about OER can help colleagues to think about their own rights and to consider how to express, in unambiguous terms, what they will or will not allow people to do with content that have created. The beauty of Creative Commons licenses is that they are designed to enable reuse, rather than prevent it. Admittedly CC licences are not perfect, the Non-Commercial clause is widely regarded as being particularly problematic but it’s no exaggeration to say that they have played a fundamental role in facilitating the development of open education and OER. Creative Commons licenses are now so integral to my work that I can’t imagine life without them and I can’t think of copyright without also thinking of Creative Commons. So the task for Thing 11 & 12 is to find two CC licensed resources and then find or create an OER, so in the best traditions of Blue Peter – here’s one I prepared earlier! Two CC licensed images from flickr and the open education resource I used them in – a guest lecture for the University of Edinburgh’s Introduction to Online distance Learning Course. 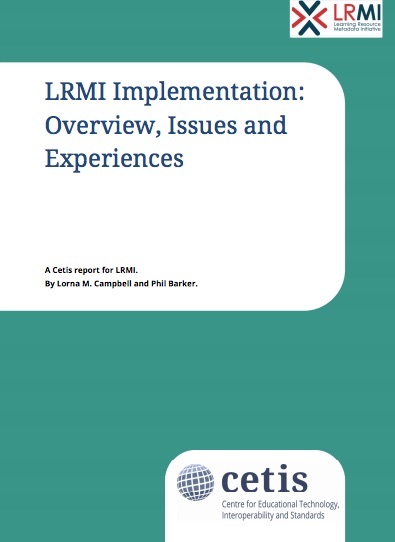 The synthesis report is available from the Cetis Publications site here: LRMI Implementation: Overview, Issues and Experiences. Successful applicants will be required to develop an open policy project that will contribute to increasing openness within their institution and field of work. The closing date for applications is 30th of June 2014.